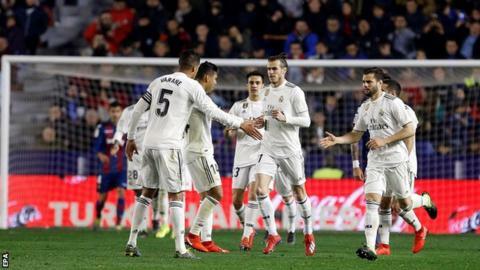 Real Madrid forward Gareth Bale was "ecstatic" after scoring the winner against Levante despite shrugging off the celebrations of team-mates, says his manager Santiago Solari. Bale, 29, scored a penalty in the 78th minute in Sunday's 2-1 win - just four minutes after coming on a substitute. The Welshman jogged back to the centre-circle stony faced and brushed off the celebrations of Lucas Vazquez. It was the sixth time in the past eight games Bale has started on the bench. "I'm very pleased. He can celebrate the goals however he likes," said Solari. "He was ecstatic when I saw him in the dressing room having got his goal. "I'm thrilled with how he went out there and he looked hungry when he got on the pitch. He clinched the win for us and worked extremely hard. "You have an awful lot more eyes than we do, but we're there and what I saw is how hungry he was to get on the pitch and help the team. Bale joined Real from Tottenham in 2013 for £85m and has gone on to score 101 goals in 220 games for the Spanish giants, as well as winning four Champions Leagues and one La Liga title. But his future at the Bernabeu has been a talking point in recent weeks and he has been used sparingly by Solari since returning from injury. After coming on and scoring against Atletico Madrid on 9 February, Bale made an arm gesture as he celebrated, with La Liga asking the Spanish Football Federation to punish the winger. Goalkeeper Thibaut Courtois has been quoted as saying Bale has not adapted to the Spanish way of life and snubbed a night out with team-mates. Full-back Marcelo told Marca that Bale does not speak Spanish and only communicates with gestures. Why is Bale's career under a cloud?